Having already won on Merseyside when scoring on his seasonal return at Aintree Racecourse, Emma Lavelle's Paisley Park doubled up under Aidan Coleman. Paisley Park just got up in a dramatic finish to collar both Shades Of Midnight and favourite First Assignment. Captain Cattistock and Shades Of Midnight set a decent gallop throughout at the head of affairs, with Pasiley Park held up in the rear. They were still there turning for home in the extended three-mile contest, but First Assignment came through to lead over the final face. Captain Cattistock crashed out at the final hurdle as Shades Of Midnight and the favourite battled all the way to the line. But having saved some energy Coleman stoked up Paisley Park and he eventually swooped late on to claim a narrow half-length win over Shades of Midnight. The Grade One Long Walk Hurdle at Ascot is the likely next target and should he win again a crack at the Stayers' Hurdle at the Cheltenham Festival in March is possible. But for now Lavelle was celebrating after executing the perfect plan. Lavelle said: "I wish it would have been a bit more relaxing. But he has just got better and better. This had always been the plan, but very rarely do the plans come off so it's great the way it worked. "In fairness to him, he jumped well and was always taking it a little bit behind the bridle. And in a way that's what won him race, as he still had plenty left in the tank when he was finishing. It would have been more relaxing for me had it been without the last-gasp bit, but it is brilliant. "It was a fair performance carrying 11st12lb out there today. So I think he is exciting. Almost as exciting as his owner. In reality that is going to push him out of these handicaps. 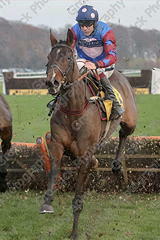 I would say (owner) Andrew's (Gemmill) great plan has been the Long Walk (Hurdle) at Ascot. So I will be guided by Andrew for a change. "I don't think this horse wants the ground too soft. Just on the slower side is great but I think once it gets into a bog I don't think it is his round. But we can safely say he is very nice. And Aidan gave him a brilliant ride. He did everything right"
She added: "I will take it one step at a time. Step by step but he exciting. That is our first £100,000 race to win so it is memoralble one. This is out biggest here and Haydock has been a good track to us. We like it here." The £100,000 Betfair Stayers’ Handicap Hurdle has proved to be a highly informative contest since the initial running in 2005, largely due to the demands of the obstacles, introduced in 2007, which are more like mini-fences than the traditional hurdles seen at the majority of British racecourses. With more of an emphasis on jumping than conventional hurdles, the three-mile contest has attracted a fascinating mix of top-quality hurdlers and seasoned chasers.